KABUL, Afghanistan — At least six people were killed Saturday when a trio of suicide bombers struck a funeral attended by senior government officials, just three days after a powerful truck bomb in one of the most heavily guarded parts of the capital killed 90 people and wounded more than 450. 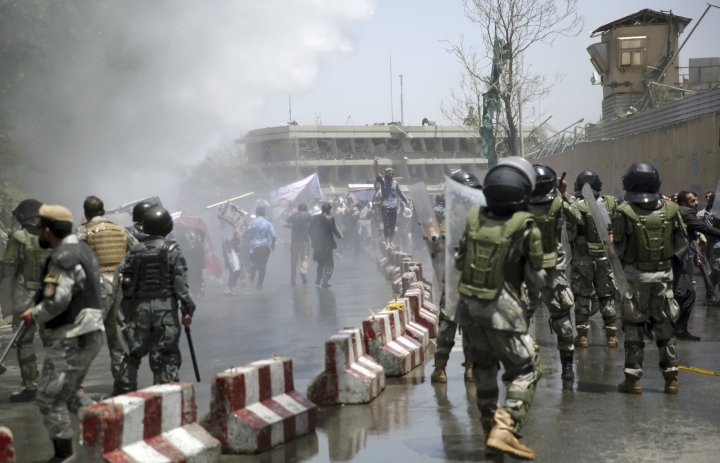 The string of high-profile attacks has raised serious concerns about the ability of Afghan authorities and security forces to provide even the most basic levels of protection for its citizens. 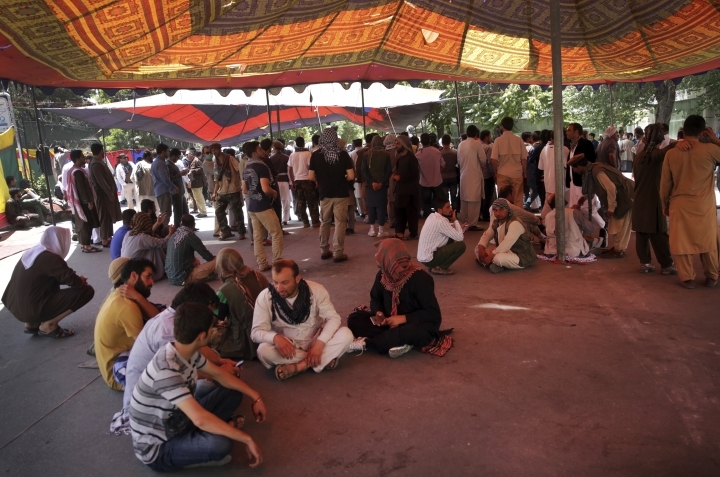 Wahid Mujro, spokesman for the Public Health ministry, said 87 people were wounded when three explosions rocked a cemetery where Salim Ezadyar, the son of a senior Afghan parliamentarian, was about to be buried. Ezadyar was one of several people killed Friday when police clashed with protestors who were demanding better security in the capital. Afghanistan's chief executive Abdullah Abdullah was in attendance at the funeral and appeared live on television afterward. He said the explosions came from a trio of suicide bombers and demanded an investigation into how the attackers were able to get so close to a funeral attended by senior government officials. Abdullah also called for an investigation into whether police used live fire against protestors on Friday. The nature of Friday's demonstration shifted when protesters — many calling for the country's leadership to resign — attempted to move closer to the palace and some rushed police, who fired warning shots and used water cannons and eventually tear gas in attempt to disperse the crowd. The city's police chief said some demonstrators fired weapons in the direction of his men. President Ashraf Ghani, meanwhile, met with senior security officials during an emergency security meeting. A statement from the president's office said the meeting called for an investigation into the nature of the deadly violence at the protest. Ghani spoke briefly on television and call for national unity. "Terrorist groups plot to sow chaos. Their aim is to create poor governance and disorder in communities," he said. "We must not let ourselves fall into the trap that the enemies have brought to our country." 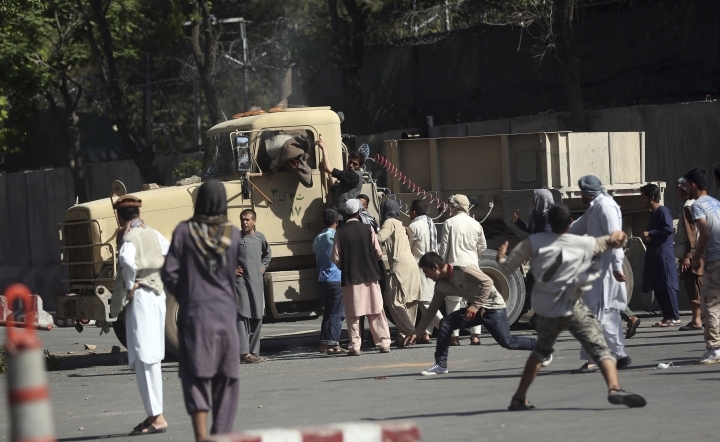 Most of the casualties from the truck bombing were civilians, including women and children, officials have said. But the dead also included Afghan security guards at multiple the facilities, including the U.S. Embassy. A U.S. State Department official said 11 American contractors were wounded, none with life-threatening injuries.